This is Room 73B . 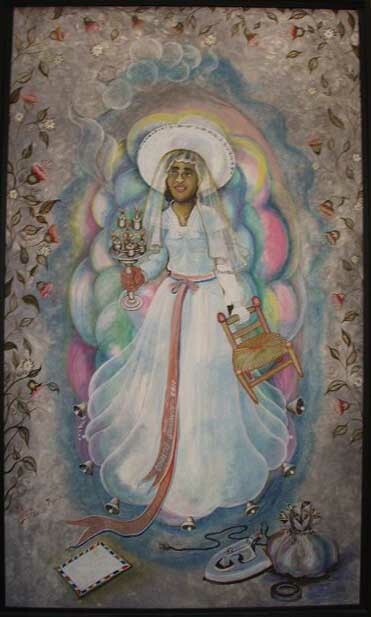 Haitian Art by Lionel St. Eloi. St. Eloi was born in 1950 in Port-au-Prince. He is a product of the art movement known as "Poto-Mitan" where he painted, played music and danced. He is one of the more eccentric and interesting Haitian artists. His paintings are always unique and sometimes monumental and his sculptures, usually tin or aluminum with brass trimming and perhaps incorporating beads, glass and mirrors, are phantasmagorical. They are usually religious representations, either Vodun or Christian. 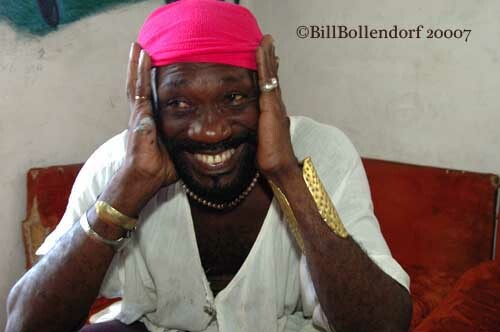 He also has been known to make Vodou flags and still plays in a musical combo. He lives in a small but tall house on top of a hill on the Rue Lionel St. Eloi in Kafou Fey. His paintings are scarce these days.